With charming main streets, picturesque marinas, historic lighthouses and five state parks, it’s easy to see why Wisconsin’s Door County is listed among Fodor’s 10 Best Small Towns in America. 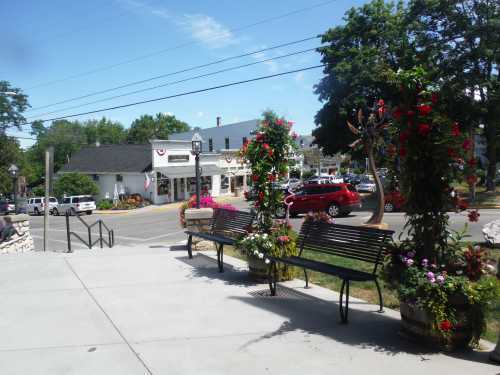 Fish Creek’s pristine, charming streets adorned with benches and colorful flowers earned this beauty a spot on Forbes’ America’s 15 prettiest small towns. Until my recent visit to Door County, all I knew about Wisconsin was it has great cheese and is the home state of my family’s favorite football team, the Green Bay Packers (and we’re from L.A.). But Door County’s fish boils, cherries, theater, art galleries and outdoor sports make this Wisconsin peninsula an ideal coastal family retreat year-round. 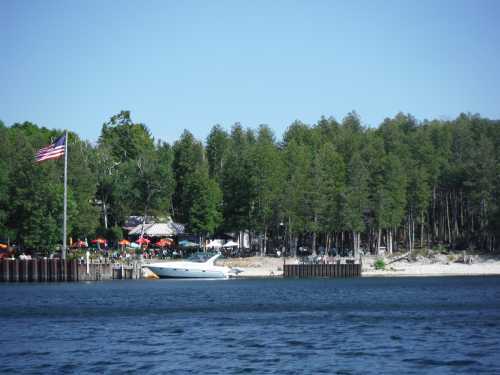 The 70-mile stretch of peninsula is surrounded by Lake Michigan to the east and the waters of Green Bay on the west. With a population of about 10,000, Sturgeon Bay is the county’s largest town. Several small pretty towns with a Cape Cod feel grace the shoreline. Up and down the peninsula are many third and fourth generation Door County residents who come home after college to help run the family business. No chain hotels or restaurants here. Independently-owned establishments and friendly customer service contribute largely to Door County’s old-fashioned charm. Passengers get scenic coastal views on Shoreline Charters’ narrated boat tours. While Sister Bay’s beach, marinas and boat tours are the main attraction, visitors also come to see goats grazing on sod rooftops. Now there’s a photo opp! But a trip highlight for me was a narrated boat ride with Shoreline Charters. From the Sister Bay Marina we cruised by towering limestone cliffs, sea caves and million dollar homes. Neighboring Ephraim (a dry town so forget the wine with dinner) is a historic waterfront village with water sports, museums and shops. In Fish Creek, recently listed among America’s 15 prettiest towns by Forbes, we strolled on cozy streets adorned with colorful flowers and cute boutiques. Kayaking at Nicolet Beach is a breeze! Door County’s largest state has 40 miles of trails and eight miles of shoreline punctuated with 150-foot high cliffs that can be explored by biking, hiking, sailing and kayaking. 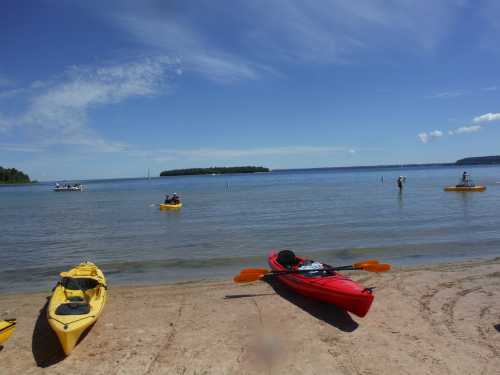 We rented kayaks at Nicolet Beach and paddled two miles through clear water to uninhabited Horseshoe Island. There, we hiked a one-mile, shaded loop trail before heading back. More scenic points within the park include the 1860s Eagle Bluff Lighthouse overlooking Green Bay, and Eagle Tower, a 76-foot observation tower with views of the Michigan shoreline and surrounding islands. At the DC Adventure Center, we rented stand-up paddleboards and got close up views of ducks and other wildlife. The shoreline is rocky, so wear sturdy water shoes. 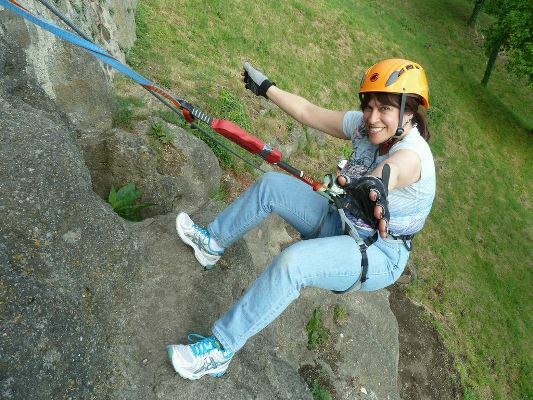 The center also operates a four-span zipline through the forest, ideal for kids or first time riders. Closed-toe shoes are required. Over dirt trails and through the woods we go to the lakeshore with Seaquist Segways. Our most exciting adventure here was an off-road Segway tour. 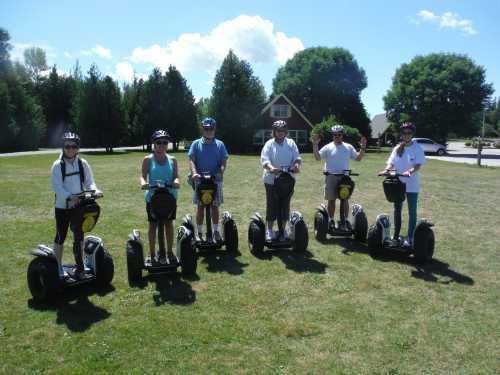 After a 30-minute training, Steve Seaquist, owner of Seaquist Segways, led us on an exciting off-road tour through the forest. The Segway’s over-sized wheels easily cruised over rocks and tree roots. Seaquist, whose family settled in Door County in the 1860s, led us to a beautiful spot at Sand Beach. It’s here that I ate fried cheese curds, a Wisconsin staple, for the first time – and loved it! Owners/chefs Britton and Sara Unkefer create exquisite pizzas, such as the Fun Guy – a mushroom pizza with spinach and caramelized onions on garlic cream cheese. 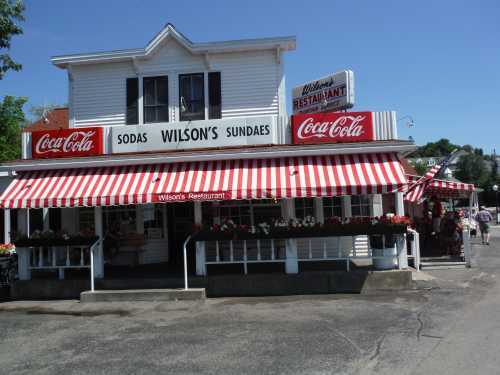 This Door County landmark has served up classic burgers, sandwiches, fries and desserts since 1906. Save room for a sundae! Located on the edge of Little Sister Bay, is a casual beach eatery with a happy vibe, good food, signature cherry margaritas (yum!) and amazing sunset views. The Door County Coffee & Tea Co. uses top quality beans roasted onsite for the best cup of coffee around. Only the best will do for business owner Vicki Wilson, who ensures customers enjoy top quality coffee made with Arabica beans roasted onsite. The charming restaurant also serves delicious breakfast (try a strata and hashbrown bake) and lunch. This full-service eatery is known for its traditional fish boil featuring freshly caught Lake Michigan whitefish, red potatoes and onions. Kerosene is thrown on the fire, causing the pot to boil over with fish oil. Door County has many unique lodging options. We stayed at the Landmark Resort in Egg Harbor. Our spacious one-bedroom condo had full kitchen and living room (with a sofa sleeper) overlooking the lake. Swimming pools, whirlpools, barbecue grills and walking paths make this an ideal lodging option for families.